Once you have created a shop and added your products, you will need to provide a way for your customers to order your products and to choose their preferred delivery option. Setting up this section is optional - you do not need to set up any payment or delivery options. You can simply just provide a product list for visitors to browse. The delivery preferences will only work and be applicable if you choose to use PayPal. The first thing that you will need to do, is open the Payment & Delivery Settings. To do this, from the Main Menu, select Shop Manager from under the Pages & Content header. Then from the Shop Links section on the right, select Payment & Delivery Settings. In order to make it possible for customers to purchase your products, you can either list Alternative Payment Options or use PayPal. Alternative Payment Instructions: If you don’t want to use PayPal, you can provide instructions in the Alternative Payment Instructions field for how customers can place their order, for example you could provide a telephone number or email address. As delivery options will only work with PayPal, you may want to provide some brief delivery information here. PayPal: To use PayPal; you will first need a PayPal account. If you don’t already have one, you can click here to Sign-Up. Once you have an account, setting up your shop to take payments is as simple as entering your PayPal Email Address in the associated field. You can also enter a Notification Email Address and select your Billing Currency. 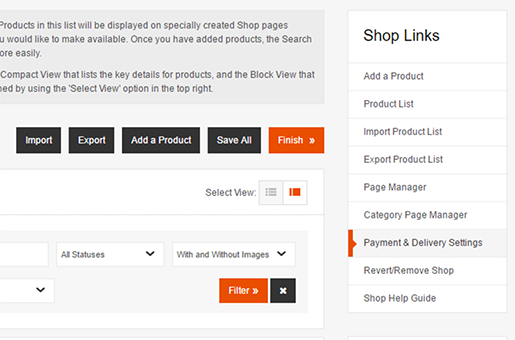 After setting this up Add To Trolley buttons will automatically be added to your products. The trolley and checkout will all be taken care of for you. As mentioned previously delivery options will only be available if you are using PayPal. 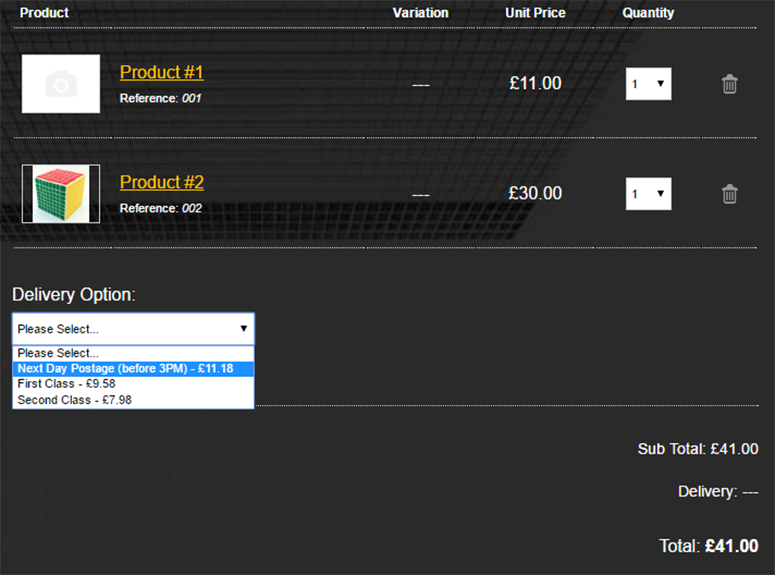 Customers can select the delivery type and it will be added to their trolley. 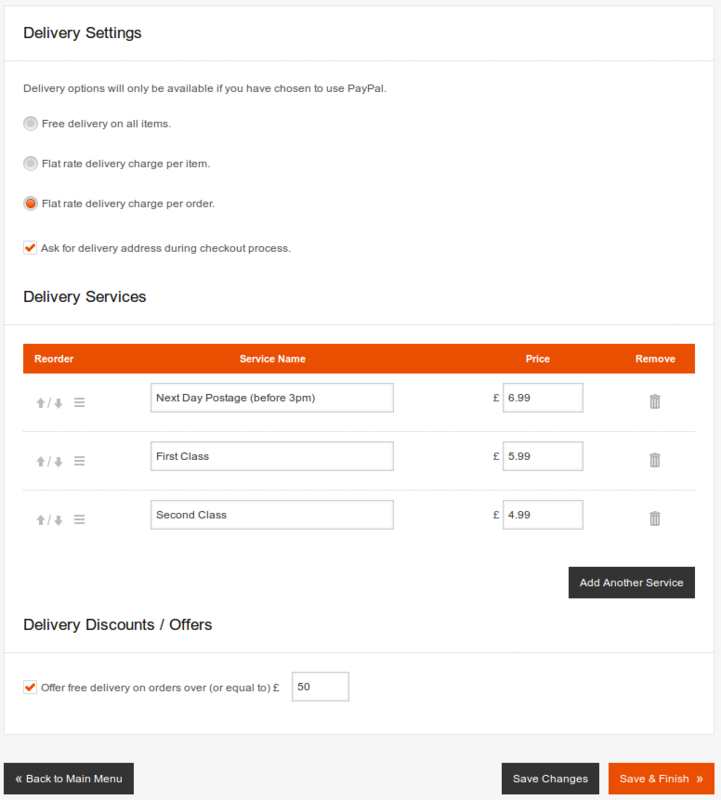 By default the delivery will be set as free delivery, and doesn’t have any customisable settings. You can select to either add a flat rate delivery charge per item or flat rate delivery per order. Once you have selected one of these settings, you can add different services and offers. Flat Rate Delivery Charge Per Item: You will need to add a Service Name (such as standard delivery) and Price in the fields provided. If you would like to add multiple options (e.g: standard, next day, signed for delivery), press the Add Another Service button and repeat the process. 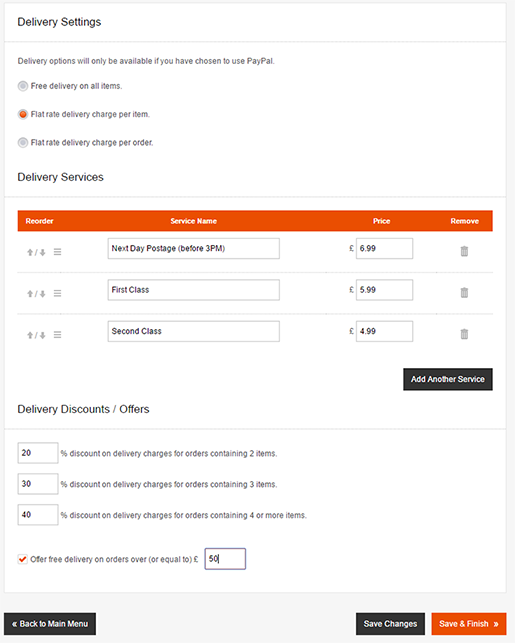 The Delivery Discounts/Offers section allows you to offer a percentage discount for multiple items – you can enter the discount in the fields provided for 2, 3 or 4+ items. You can also specify that orders over a certain value qualify for free delivery – by checking the box and entering the value. 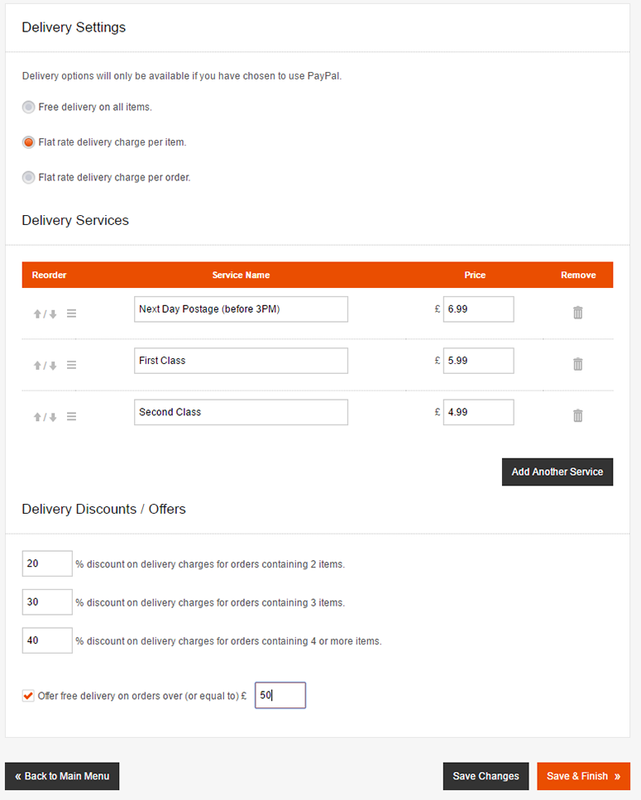 Flat Rate Delivery Charge Per Order: You will need to add a Service Name (such as standard delivery) and Price in the fields provided. If you would like to add multiple options (e.g: standard, next day, signed for delivery), press the Add Another Service button and repeat the process. You can also specify that orders over a certain value qualify for free delivery - by checking the box and entering the value. Once you are happy with the information entered – press Save & Finish. You were 100% right - great support!